Numerous voices tell us constantly that there is no such thing as impossible. You can do whatever you want to do and you can be whatever you want to be. And this extends to obeying God’s commands. Many of our problems in living for Jesus stem from the root problem that we think we can do it. We think that we have the power within us. We are told we can do it. We know we are supposed to be able to do it. If we aren't able to do it there is something wrong with us. So we all pretend we are doing it when deep down we know we aren’t. That is the madness of our lives. It is the slavery of the impossible. Author Jonty Allcock looks at eight impossible commands and four steps that will help us depend on God, bringing us to spirit-led obedience – I can’t, I’m sorry, Please help, and Let’s go! 5.1" x 7.8" x 0.6"
Here is an encouraging and digestible book about obedience! Grounded in Bible truth, these chapters give not just an argument but a call that's clear and full of hope. The biblical path to obedience is plainly laid out, with the necessary first step: "I can't." But what a blessing to consider the subsequent steps that in fact lead us to obey: "I'm sorry"; "Please help"; and "Let's Go." I'm grateful for this call to follow the Lord Jesus with joyful obedience. There are usually two human responses to the difficult commands of Scripture: we come away either overwhelmed or dismissive. Either we despair at the way we fall short or try to water them down so as to fit our most comfortable behavior. But this book offers a different way—a more biblical way. God did intend for us to obey, otherwise he wouldn't have repeatedly told us to do these things. And yet he has always provided a way, in Jesus, for us to fulfill what seems impossible. This book is exactly what Christians like me need, who both see our inadequacies and God's tall orders. Jonty Allcock offers a pathway of grace-fueled obedience, a pastoral word to the tired, discouraged, lazy, and indifferent. God's people need this word and God has raised up this pastor and this book to be that word. Often in our churches we fall on one of two spectrums regarding the commands given in the Bible. We brush them off as legalism or hold too strongly to them, believing obedience can make us more holy. Both sides are on to something. 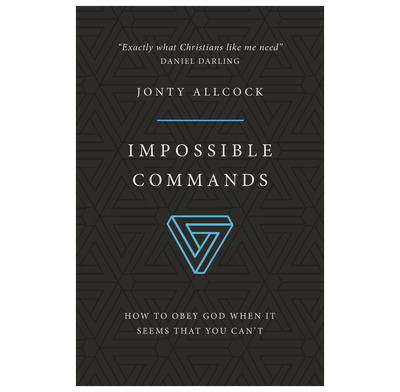 Jonty Allcock brings these sides together in this helpful book on the "Impossible Commands." Yes, we can do nothing to save ourselves. It's all grace. But we are also called to holiness. It's all grace. Allcock helpfully shows us all that God's commands are serious, but the power to obey those commands is ever present. I was challenged, encouraged, and strengthened.